Want to attend a blogging conference but not sure about leaving your baby behind? Good news – there are baby friendly conferences. After attending BlissDom with 4 month old Xander, I thought I'd share some of the pros and cons of having him with me as well as a few tips that worked for me. Take what works for you and apply it and leave the rest. Baby can be a conversation starter if you need help breaking the ice. Perfect excuse to go take a nap. Ensures you'll take time to decompress. You won't feel as alone. Easy for others to spot you in the crowd. Hard to attend late night activities. May need to step out of sessions. May keep some people from approaching you. Lots of extra stuff and gear to pack. Is the conference baby friendly? Or offer child care? How much traveling/walking will you need to do between your room and the conference site? Are you comfortable feeding baby in public? Are you comfortable changing baby in public? Can you afford to miss a session? How does baby handle crowds and strangers? Depending on your mode of transportation, you may have more flexibility with packing. 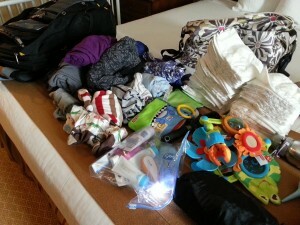 We flew, so I had to be selective on what I took and juggle it all (plus the baby!) alone at the airport. Overall I found people to be quite pleasant (other than the crew that went around me, cutting in front of me as I approached the security scan point… without so much as an “excuse me” or “sorry.” I was one person away from grabbing my bins when people started going around me in line. I couldn't tell they were crew because of their jackets and I ended up asking “if everyone was going to keep going around me?” A flight attendant said “we have to stick together” in a snotty tone. Someone else just said “we're crew.” I say, common courtesy still trumps that but I digress…). I tried to keep in mind the times we were flying – not when most passengers expect to sleep, not during his fussy time, and around his normal sleep times if possible. I took the Eddie Bauer Baby travel system I reviewed last fall to maneuver through the airport and at the conference. Check the car seat laws of where you are going – most states require a car seat even in taxis except New York – as far as I know. I took the seat without the base because it had an easy seat belt install. 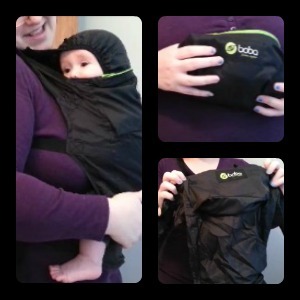 I also took along the (Amazon affiliate link) Boba Air soft structured baby carrier that I received to review. It is thinner and lighter than the Boba 3G (you can read my review by clicking on Boba 3g). The material is nylon like a windbreaker. It folds into itself, creating a little pouch which is perfect for traveling. I would rotate through X in the travel system, on my lap, wearing him (especially for getting him asleep), and others holding him. You can see me wearing him while tossing pizza dough at BlissDom! Overall I liked the Boba Air for traveling because it took up way less space than our other carriers. Since it has less padding, though, I found it to be less comfortable than the Boba 3G. I wouldn't recommend the Boba Air for long or frequent use, but for shorter periods of time and traveling – definitely. It's perfect as a spare carrier you can keep in the diaper bag or glove compartment too. Everything into a carry-on and a personal item! I only packed carry-on luggage. I felt dealing with checked luggage was too much on that trip so I crammed EVERYTHING into my (Amazon affiliate link) Targus laptop backpack – best laptop bag I've ever bought! – (stowed overhead) and my Amy Michelle cross-body diaper bag (stowed under the seat). Since X is under 2 years old he could fly for free in my lap. Flying in his car seat in his own seat is the safest option, but I knew I'd be holding and nursing him most of the time anyway. The travel system was gate checked for free. Tip for packing clothes: roll them! You save so much space that way – that's how I packed for 2 adults and a toddler into one suitcase and 4 carry-on items for our 5 day trip to NYC for BlogHer last year. It's also how I packed for BlissDom. This one I can't stress enough. You need to be okay with stepping out of sessions so you and baby don't disrupt everyone else. Most of the time X was asleep, nursing or happy, but there were times we went back to the room to chill or walked around outside the sessions. 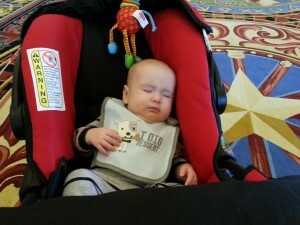 Have you ever taken a baby to a conference? What was it like for you? What tips do you have to share? Any questions if you are thinking about taking your baby along to a conference? Get weekly sanity saving parenting tips, recipes, and kids activities. Darcy lives outside of Milwaukee, Wisconsin with her husband, their 8 year old daughter, 6 year old son, two cats, and a rescue dog. She loves to share kids crafts, simple recipes, and parenting tips to help other moms. She's passionate about education (which is why she is a PTO board member and Box Tops Coordinator) and all things babies. Darcy loves purple, geek culture, and making an ordinary life feel extraordinary. She and her family enjoy exploring Wisconsin and planning local adventures. Author of Breastfeeding 101: Beauty in Breastfeeding, available on Amazon. Her writing has also been featured on Babble, CafeMom, and Mom.me. I have never been to a conference nor do I have a baby, but I really enjoyed this post. There are definitely a lot of things to consider! I’m sure that id likely bring my baby along because id miss him or her otherwise. Really great thorough post Darcy! You’re welcome! I know some people think mom shouldn’t go if she can’t leave baby behind but the choice is much more complex than that in many cases. Glad you found this helpful! I cannot even imagine going to a blogging conference with children let alone a baby. You must have the patience of a saint. I wish I could say that was the case but it’s not! A sleepy newborn was way easier than my toddler. I have taken babies on long trips before, but going to a conference seems super stressful. I haven’t been to one and for the most part it seems scary with a baby in tow. Your tips are helpful for not just conference goers, but travelers in general. Thank you, Darcy! It can be overwhelming. Thankfully I’ve known a few people at every conference I’ve attended. Glad that my tips are helpful for general travel as well! I’m planning on going to MommyCon Philly in August, which I assume will be pretty baby friendly, but I swear I remember you saying you weren’t that impressed. I’m not going for blogging specifically, but just because the topics interest me. Thoughts? Thank you for this!! I am attending a conference in October, at which time I will have an approx 6 week old newborn. My third child but haven’t traveled with or without a real BABY-baby since my oldest son (almost 7 now) was small. I’m so torn between taking baby or leaving baby home or dragging along my husband or mom to watch him in the hotel while I’m at events. I’ve been told baby is welcome but gah, I want to actually pay attention, you know? Probably just going to be a “wait and see” situation as the date gets closer and depending on baby’s personality. I’m glad you found this helpful! With baby that little they will likely sleep most of the time so you should be fine. It was much easier going with my newborn than any other time I’ve tekn one or both kids with.